WE PLANTED THIS PEAR TREE in 1996 or 1997. 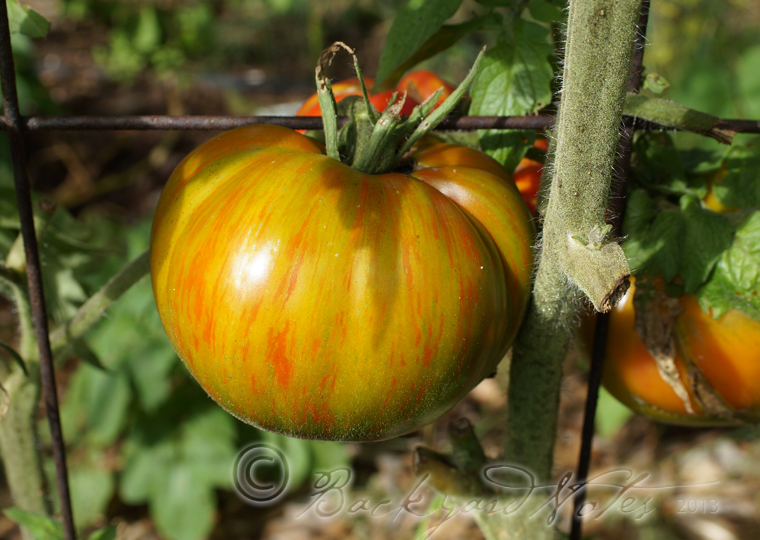 It has three varieties grafted on dwarf root stock. The tree is supported against a split rail fence, 32 inches tall and 8 feet wide. The varieties are Comice, Rescue and Bartlett. 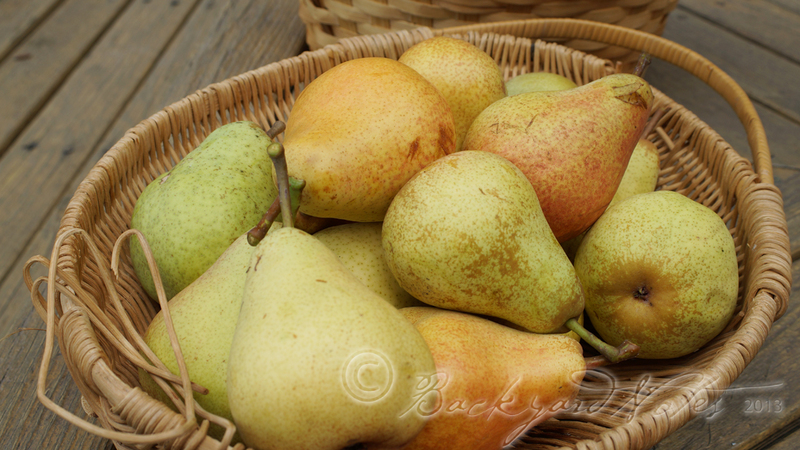 By the fourth year it began producing a reliable crop of pears and this year I harvested a whopping 72 pounds!!! Some of the branches we so heavy with fruit we had to brace them to keep from breaking under the weight. The groundskeeper thinned the tree twice after fruit was set and the tree still produced a bumper crop. I started picking the Bartlett’s in early September; a little earlier than usual, but then we had a much warmer than normal summer. 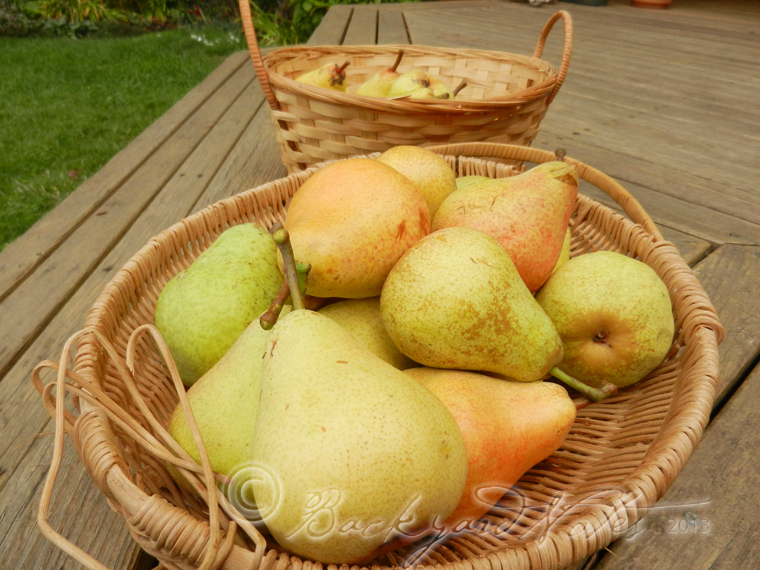 Each time I picked pears I weighed the harvest. The last bunch (Comice) were picked last week. So far, I have processed 6 half-pints of Pear-Thyme Conserve (Well Preserved); 4 half-pints Pear-Ginger Preserves; 6 pints Pears Poached in Wine; 7 pints plain canned pear quarters; 4 half-pints Pear Preserves with dried cherries. 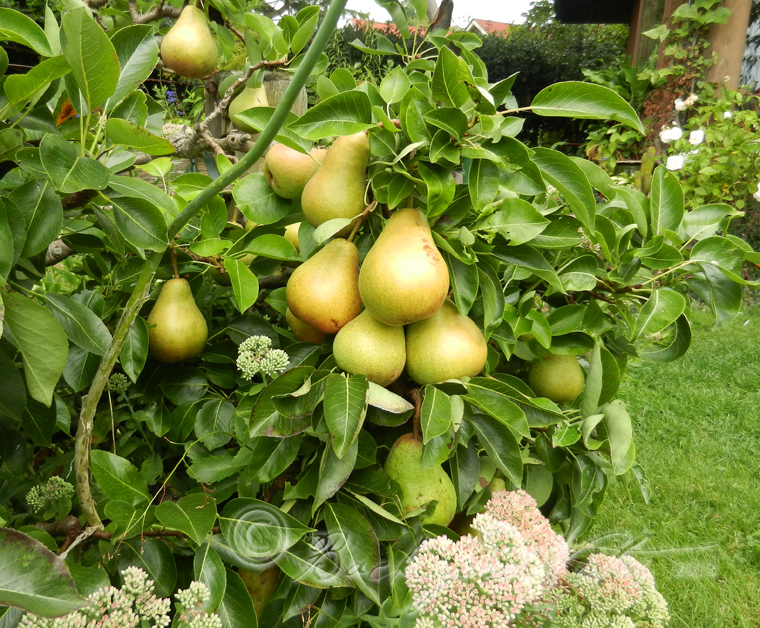 I gave pears to friend, neighbors and relatives. Yesterday I put up 5 1/2 half-pints of Pear Preserves with Vanilla and Thyme. I started with six pounds of pears. 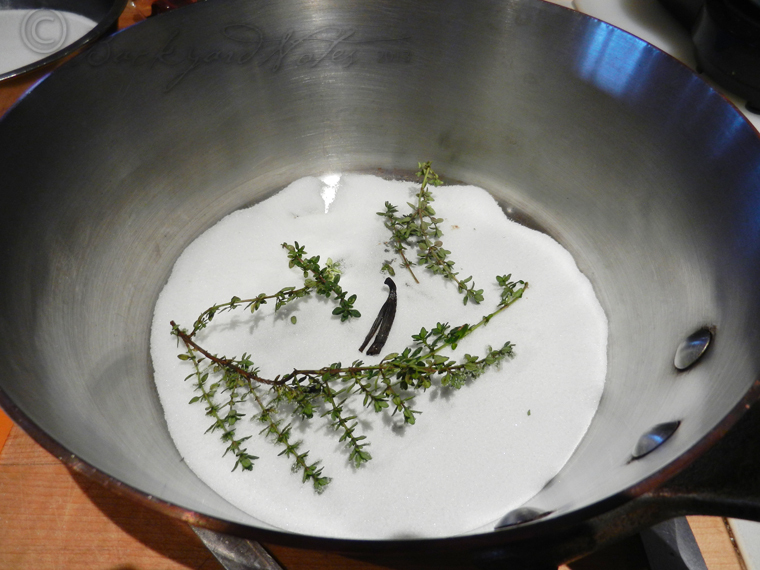 I peeled, cored and diced the pears, then layered them in a large saucepan with 17 ounces (2 1/3 cups) sugar, 4 large sprigs of thyme and one six inch vanilla bean cut into four pieces. Why do I always start with a pan that is too small? 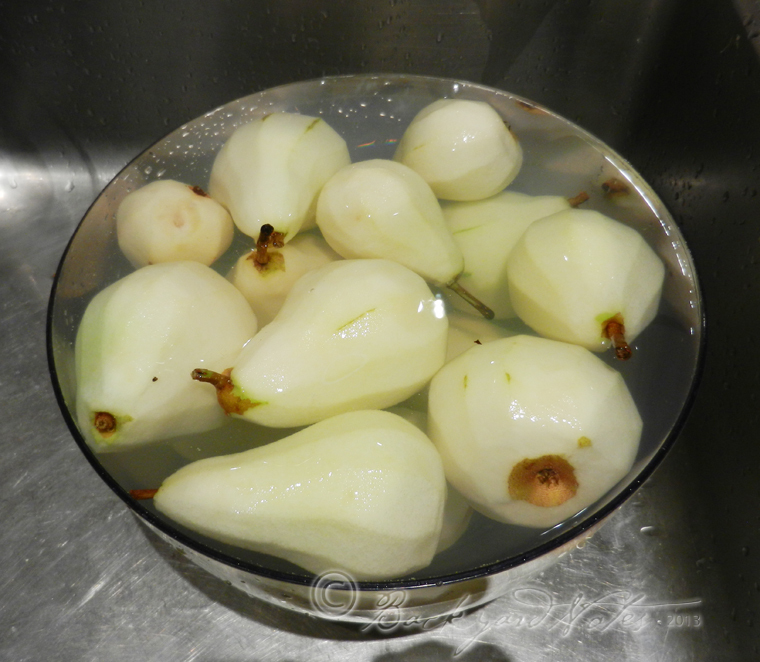 I let the pears and sugar macerate for six hours to draw out the juices. 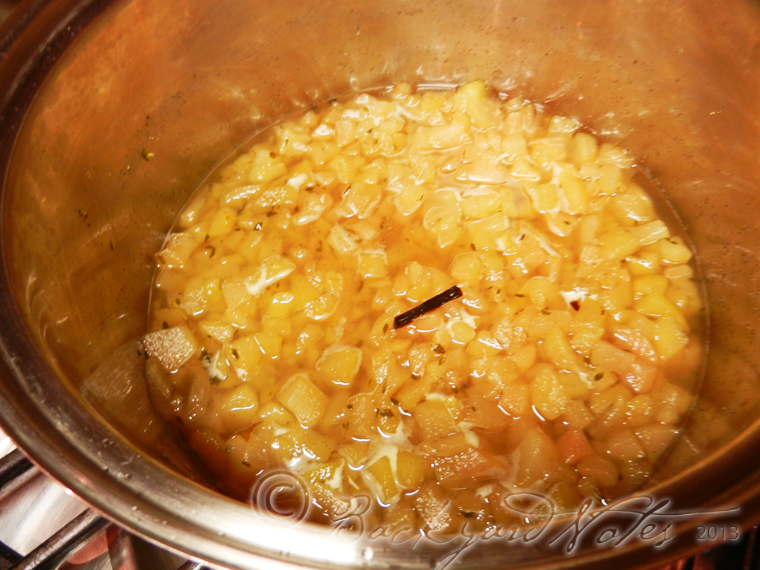 I brought the fruit and its juice to a gentle boil over medium high heat for five minutes then reduced to a simmer (barely bubbling) and continued cooking for about 4 hours until the pears were soft, translucent and thickened. Pears after about 2 hours. 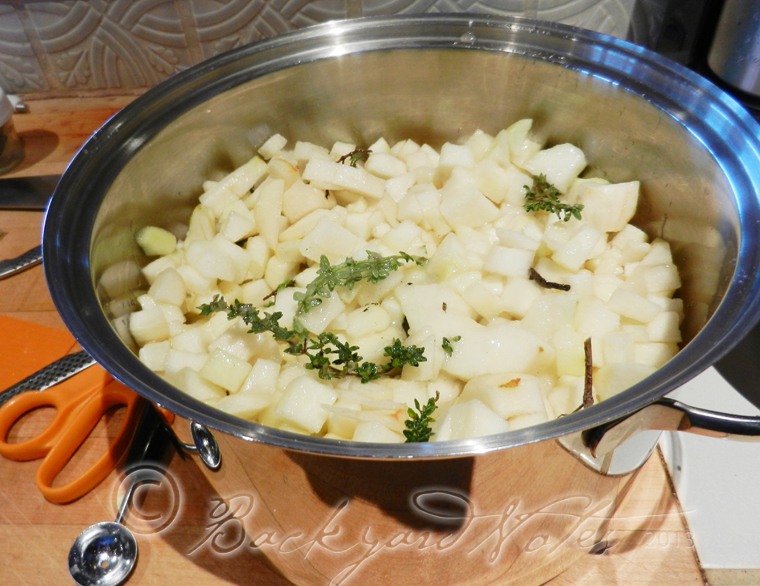 After 4 hours–the once full pot is now a quarter full! 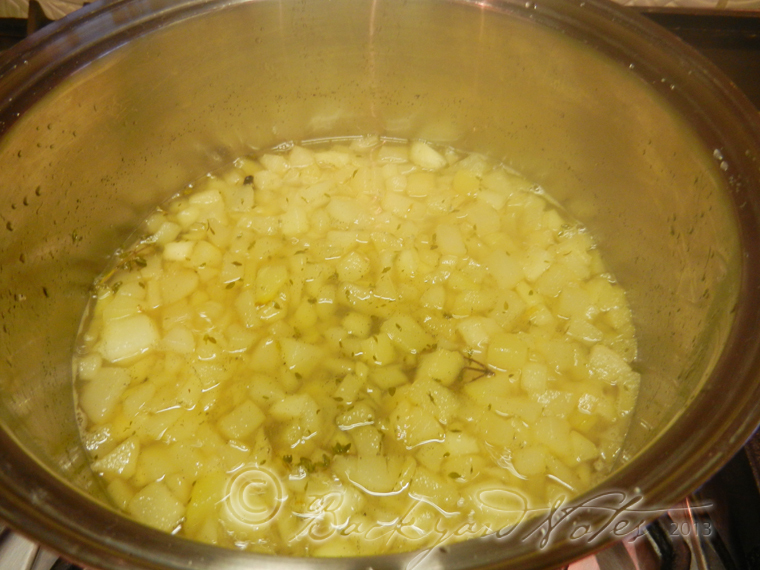 At this point when the pears are thickened, taste for sweetness. I found them too sweet for my liking so added 1 1/2 tablespoons of fresh lemon juice. I removed the vanilla bean pieces and used an immersion blender to slightly puree a small portion to add thickness/texture. If all is to your liking at this point, bring to a boil, turn off heat (Optional add: 1 1/2 tablespoons cognac once heat is turned off) and fill prepared jars; seal and process 10 minutes. Additional Note: Once the pears were substantially reduced and thickened, I removed the pears from the heat and let stand overnight and checked the set next day. The big yield for 6 pounds of pears: 5 1/2 half-pints. 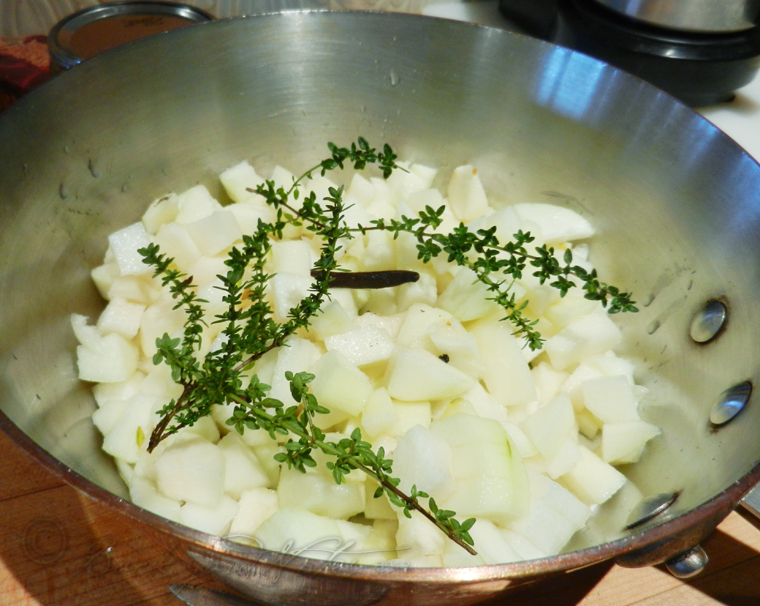 The finished preserves, flecked with thyme leaves and vanilla bean seeds, were perfect on my morning toast. I still have about twelve+ pounds left in the refrigerator. At this point they are mostly Rescue and Comice. Still to come is a standout dessert from an October 1998 issue of Gourmet magazine: Pear, Muscat, and Almond Semifreddo; a recipe by Paul Bertolli. 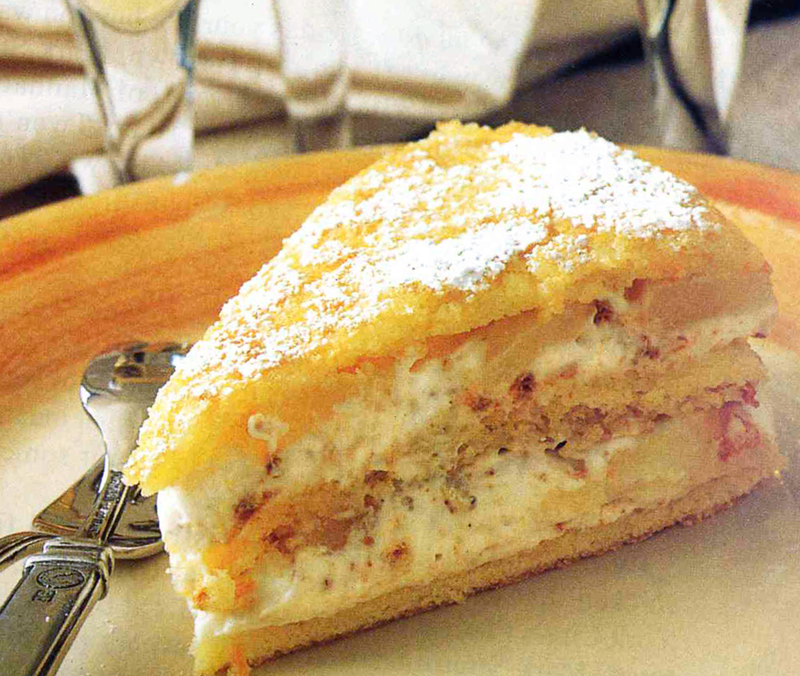 Layers of sliced, poached pears, vanilla pastry cream, crushed amaretti cookies and spongecake moistened with the syrup used to poach the pears. Unbelievably delicious. Unfortunately, I cannot locate the recipe online for a link and it is too long to copy here. What will next year bring? I have a feeling the tree may have to rest next year and the harvest will be smaller. 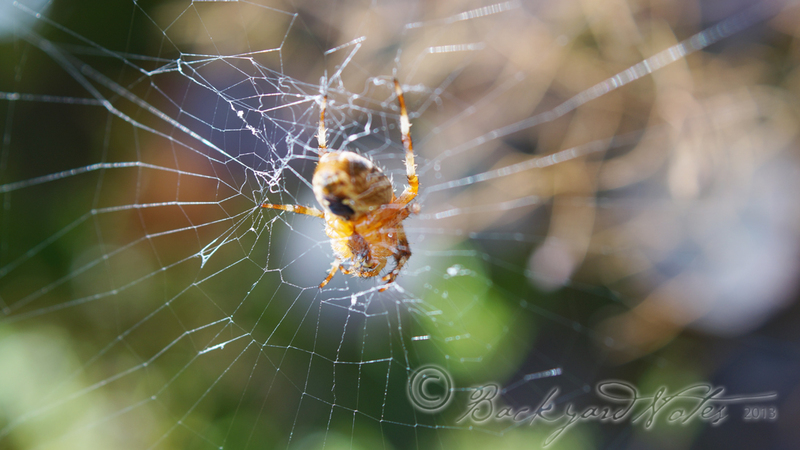 AS SEPTEMBER GENTLY NUDGES US INTO A FALL state of mind, there are lovely moments nearly everyday. 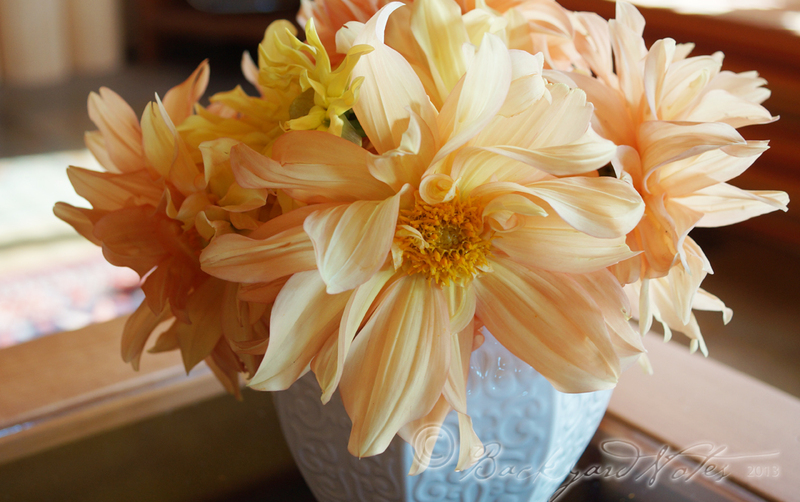 The colors of late summer and early fall flowers are rich and vibrant. Tomato harvest is peaking. 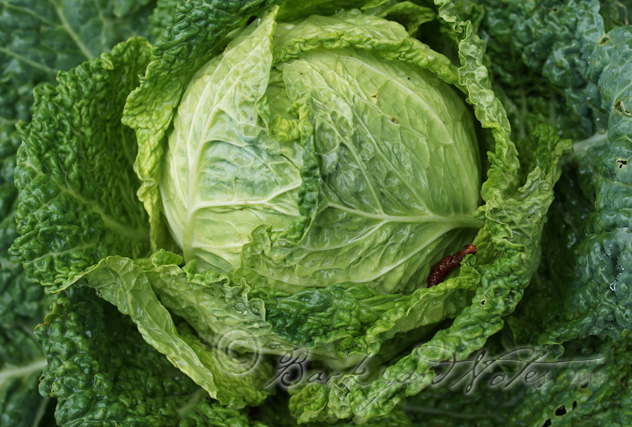 Cabbages are just this side of splitting. 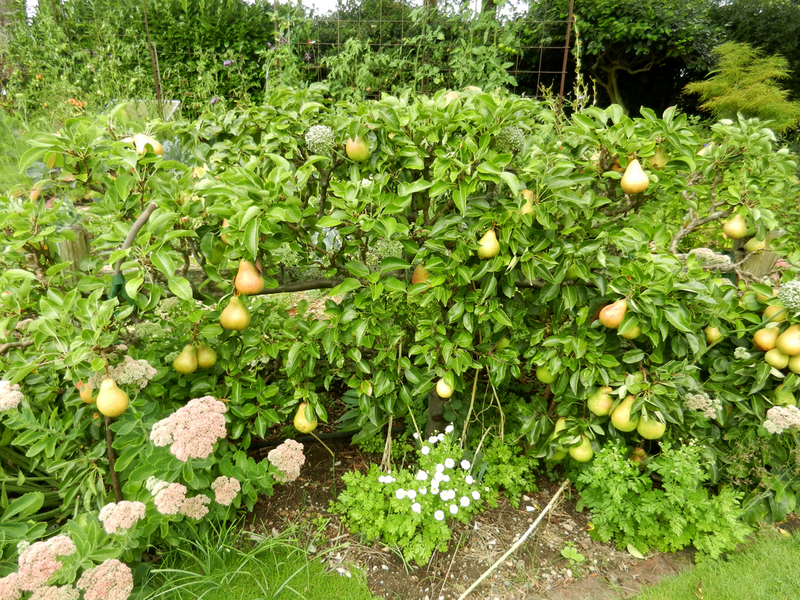 Pears need picking almost daily. Cactus are blooming! 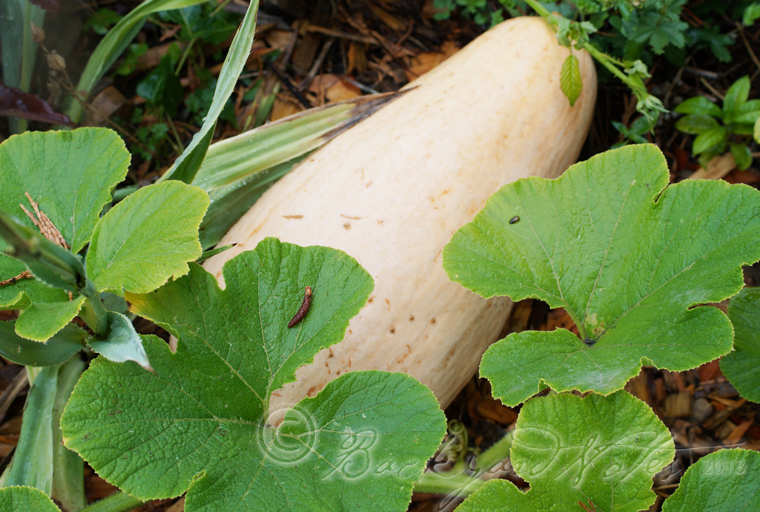 Winter squash are ripening and bees and spiders are busy, busy, busy. I’ll let the garden speak for itself. I think this is a banana squash. The seed came from the zucchini packet! 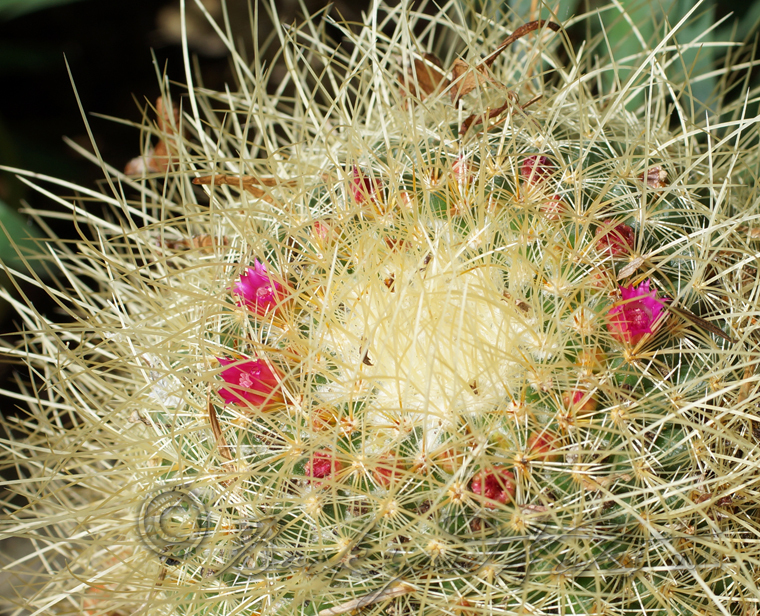 30 year old (maybe older) mammillaria pringlei. Is this a beautiful blossom? 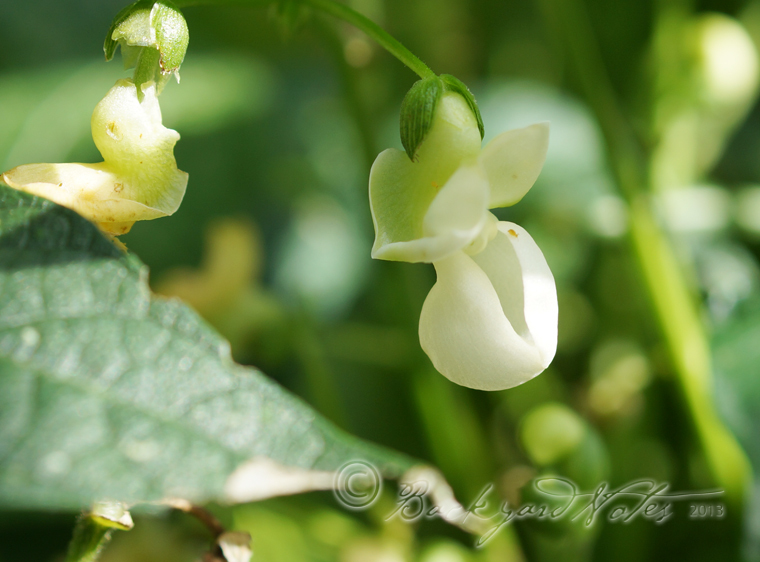 Bean blossoms are seldom seen as they are often hidden by the leaves. 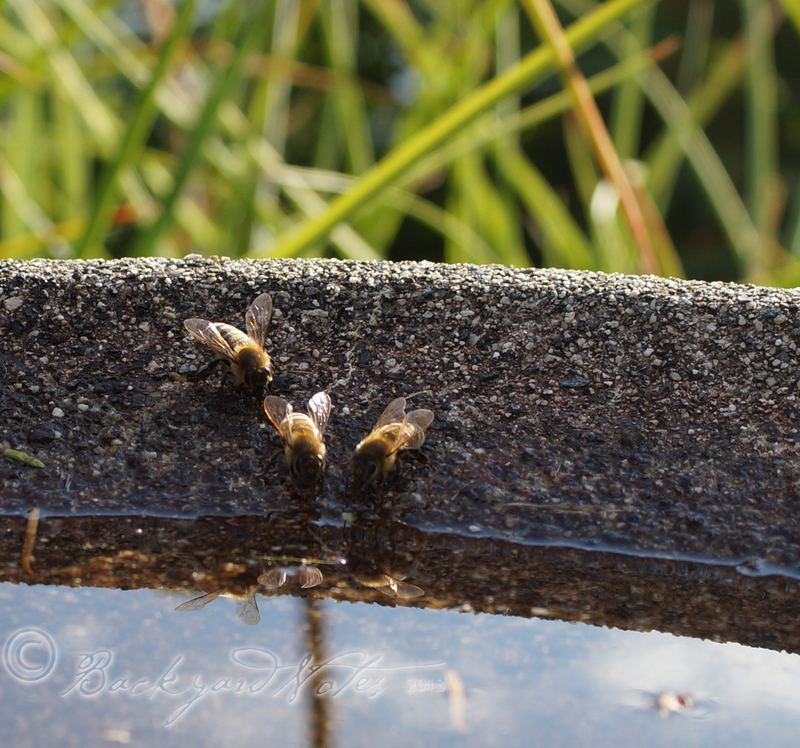 and drinking at the birdbath. 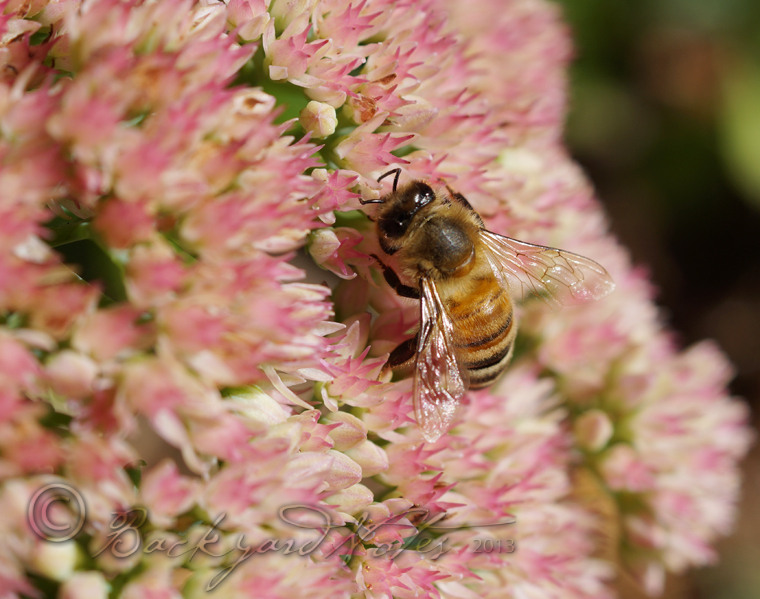 We have a beekeeper in our neighborhood–hooray! 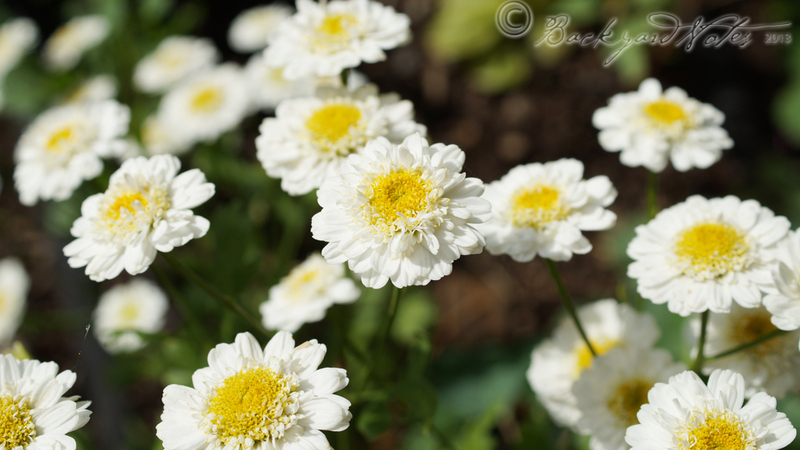 Matricaria (also known as feverfew); they look so cheerful and like sunnyside-up eggs. They self-sow freely. 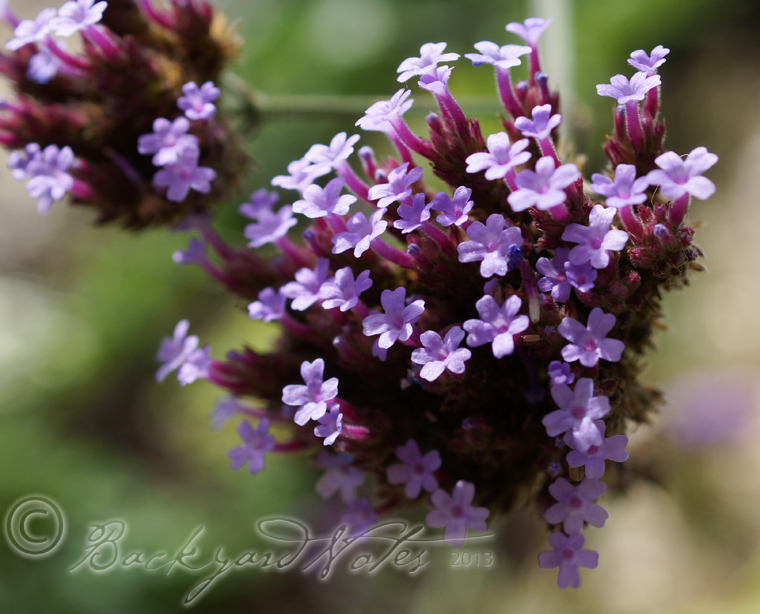 Many plants in my ornamental and vegetable gardens are volunteers, like this verbena bonariensis whose seeds likely came from compost added to the garden. 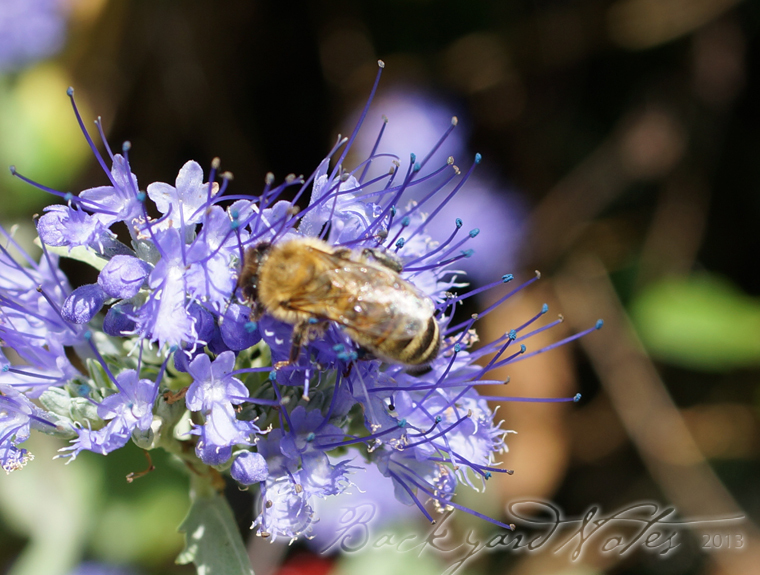 I like to leave volunteer flowers in the vegetable garden to enliven the scenery and invite lots of pollinators and predators alike.